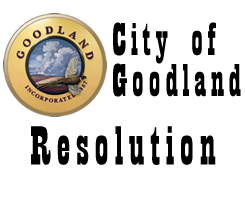 A RESOLUTION AUTHORIZING THE OFFERING FOR SALE OF GENERAL OBLIGATION BONDS, SERIES 2017, OF THE CITY OF GOODLAND, KANSAS. WHEREAS, the Issuer desires to authorize the Financial Advisor and Gilmore & Bell, P.C., Wichita, Kansas, the Issuer’s bond counsel (“Bond Counsel”), in conjunction with the Clerk to proceed with the preparation and distribution of a preliminary official statement and notice of bond sale and to authorize the distribution thereof and all other preliminary action necessary to sell said general obligation bonds. Section 1. There is hereby authorized to be offered for sale the Issuer’s General Obligation Bonds, Series 2017 (the “Bonds”) described in the Notice of Bond Sale, which is hereby approved in substantially the form presented to the Governing Body this date (the “Notice of Bond Sale”). All proposals for the purchase of the Bonds shall be delivered to the Governing Body at its meeting to be held on the sale date referenced in the Notice of Bond Sale, at which meeting the Governing Body shall review such bids and award the sale of the Bonds or reject all proposals. Section 2. The Mayor and Clerk, in conjunction with the Financial Advisor and Bond Counsel are hereby authorized to cause to be prepared a Preliminary Official Statement relating to the Bonds (the “Preliminary Official Statement”), and such officials and other representatives of the Issuer are hereby authorized to use such document in connection with the sale of the Bonds. Section 3. The Clerk, in conjunction with the Financial Advisor and Bond Counsel, is hereby authorized and directed to give notice of said bond sale by publishing a summary of the Notice of Bond Sale not less than 6 days before the date of the bond sale in a newspaper of general circulation in Sherman County, Kansas, and the Kansas Register and by distributing copies of the Notice of Bond Sale and Preliminary Official Statement to prospective purchasers of the Bonds. Proposals for the purchase of the Bonds shall be submitted upon the terms and conditions set forth in the Notice of Bond Sale, and awarded or rejected in the manner set forth in the Notice of Bond Sale. Section 4. For the purpose of enabling the purchaser of the Bonds (the “Purchaser”) to comply with the requirements of Rule 15c2-12 of the Securities and Exchange Commission (the “Rule”), the Mayor and Clerk are hereby authorized: (a) to approve the form of the Preliminary Official Statement and to execute the “Certificate Deeming Preliminary Official Statement Final” in substantially the form attached hereto as Exhibit A as approval of the Preliminary Official Statement, such official’s signature thereon being conclusive evidence of such official’s and the Issuer’s approval thereof; (b) covenant to provide continuous secondary market disclosure by annually transmitting certain financial information and operating data and other information necessary to comply with the Rule to the Municipal Securities Rulemaking Board; and (c) take such other actions or execute such other documents as such officers in their reasonable judgment deem necessary to enable the Purchaser to comply with the requirement of the Rule. Section 5. The Issuer agrees to provide to the Purchaser within seven business days of the date of the sale of Bonds or within sufficient time to accompany any confirmation that requests payment from any customer of the Purchaser, whichever is earlier, sufficient copies of the final Official Statement to enable the Purchaser to comply with the requirements of the Rule and with the requirements of Rule G-32 of the Municipal Securities Rulemaking Board. Section 6. The Mayor, Clerk and the other officers and representatives of the Issuer, the Financial Advisor and Bond Counsel are hereby authorized and directed to take such other action as may be necessary to carry out the sale of the Bonds. Section 7. This Resolution shall be in full force and effect from and after its adoption by the Governing Body.